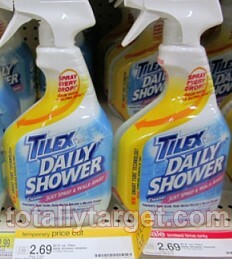 We have a nice new $1/2 Select Cleaning Items 30 oz+ Target Coupon x7/13 that is valid on Clorox, Formula 409 or Tilex. There is also still a $1/1 Clorox Clean-Up, Formula 409 or Tilex Spray Products manufacturer’s coupon available, but if you choose to share the coupon, it will increase to $1.50! Even better – select Clorox and Formula 409 cleaners 30-32 oz are on sale this week at Target thru 6/15. (NOTE– if you are having trouble with the coupon – try switching browsers- I did this in FF and had no issues)..
Tilex products are also on sale this week 10% Off- but the sale is actually a price cut that will go until 6/29. I just want to mention that you can start the video and then drag the progress bar to the end so you don’t have to actually watch it, it’s freaking terrible. When the video ends the option to share will pop up. ALSO, this has NOT reset if you printed this coupon before. I can’t find the coupon. I watched the video and shared it. Printed as $1.50 off for me… Mel – did you share via FB or Twitter? I shared via FB and printed fine hth! Also..Daisy post doesn’t say that it is a reset…. Watched the video 3 times, NO coupon whatsoever. After viewing the video, the option to share should pop up .. then AFTER you share, another link pops up saying “Print my $1.50 coupon”. One thing to possibly check is to see if the coupon link is hiding just a tad under the YouTube video box. I could BARELY make out a link, but I did find one. Only printed $1.00 though even though I shared on FB and Twitter. Just an idea! Try this. Hopefully it works. I could not see the link to share using IE. Switched to Chrome and link appeared after video finished. Printed 2 $1.50 coupons. Thank you Courtney, worked like a charm after I registered. Courtney, you are the best! Thanks!